Yes, it's a big, pink 1980s blazer--heavy on the shoulder pads and maybe even a little dumpy. Ah, but in Brenna Egan's mind, it is a garment with a simmering past: "Thalia forced herself to hit a Venice Beach Saturday barbecue after a long day on set styling a burgeoning pop star. She meant to only stay 15 minutes, but ended up closing the party down after a long, romantic kiss and a date on the books the following Monday with Cole, a mysterious music mogul. She was glad she brought her Peaches 'N' Cream blazer to avoid the late night beach chill while she canoodled with her new prince charming . 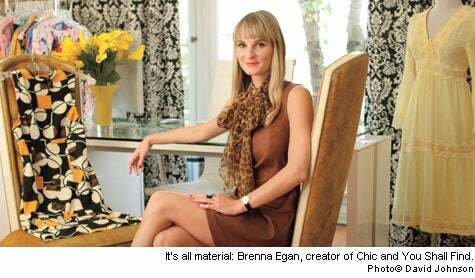 . ."
Egan is the creator (and apparently, budding novelist) behind Chic and You Shall Find , a new website specializing in stylish vintage clothing. The web, of course, is overstuffed with vintage sites, but what makes Egan's stand apart--and compulsively readable--are the "Past Life" descriptions she writes for every single garment. For a mustard yellow mini dress: "When she awoke early, she found herself bathed in the hot August sun, surrounded by empty red cups and The Who's 'Teenage Wasteland' blasting from someone's room. She could already tell that this year would be epic." For suede short-shorts: "Tawny had spent the winter cross-country skiing across Idaho and was more than ready to ditch her cold weather garb. But when the sun started shining, she couldn't bear to part with her fave leather vest. So, being the innovative girl that she was, she refashioned it into a pair of bangin' short-shorts and rocked them all summer long." Egan--a former West Coast fashion editor for OK! magazine and fashion assistant at Vogue--says she begins concocting the stories right after she zeros in on a garment. The more inspiring the piece, the easier the back story. She launched the online store in February after years of dreaming about owning her own vintage store--a prospect that, in this economy, ultimately felt too risky. "The web was the perfect answer," she says. "I could parlay my styling skills and writing skills. It's all the good things I like." The site offers a wide, and well-curated, selection, with most of the pieces priced at less than $100. Nearly every item sells quickly, Egan says, and the big challenge is getting fresh merchandise posted fast enough. Aside from hunting down covetable clothes and writing tall-tales copy, Egan also acts as the site's photographer and model booker, shooting professionals and amateurs (her friends, mostly) at her house in Los Angeles. "That's why I'm super picky about what I buy," she says. "Posting each piece is a labor of love."